View our many models below or download our spec sheet here. Download our spec sheet here for more information. Dual fuel lifts are suited for both indoor and outdoor use as they can be run on gas or propane. The benefit of a dual fuel lift is that they are able to alternate between running on propane for indoor applications and gasoline for outdoor use. All outdoor lifts are 4x4 rough terrain and some are available with outriggers for unstable/non-level surfaces. All of our rough terrain lifts are equipped with extension decks. Electric scissor lifts are run on batteries making them suitable for indoor use as they are free of emissions. These lifts are used for slab applications on concrete floors, pavement, or any other hard level/compacted surfaces. Having white, non-marking tires, makes these lifts versatile for use in shopping malls, tile floors, carpeted surfaces, and other commercial applications. With a 32” width, these lifts are able to fit through most conventional 7-foot tall doorways. All electric lifts come with an extension deck. The Genie Electric boom lifts offer quiet, emission-free operation in the most sensitive work environments. 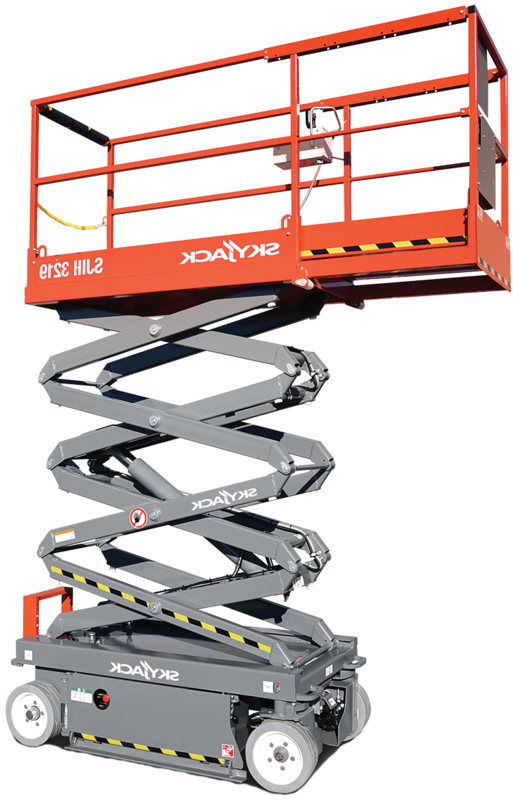 The articulating boom lift includes a rotating jib for 180°of horizontal rotation. The Genie bi-energy system combines the benefits of a 48V DC machine with the versatility of a diesel-powered generator.